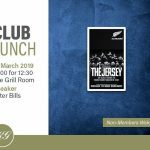 Join Kelvin Grove Club and Pan Macmillan for lunch with author Peter Bills and a talk on his new book The Jersey: The Secrets Behind the World’s Most Successful Team. 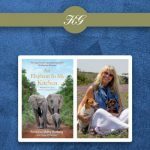 Join Kelvin Grove Club and Pan Macmillan for a club lunch with Françoise Malby Anthony, the author of An Elephant in My Kitchen. 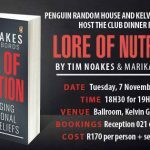 Penguin Random House SA and Kelvin Grove Club are hosting the club dinner for Lore of Nutrition by Tim Noakes and Marika Sboros: Challenging Conventional Dietary Beliefs.